Hi there! My name is Oliver Spalding and I recently completed my dissertation project - a short film called ‘All In’ - as part of my MA degree in Digital Film and Television Production. I’m launching this crowdfunding campaign in order to raise funds to submit the short film to as many film festivals as possible. Submitting to film festivals can be very costly but, after all the hard work that has gone into the production of 'All In', we really want to spread the word and get the film seen as much as possible. With your help, we can enter festivals around the world so please donate what you can today. 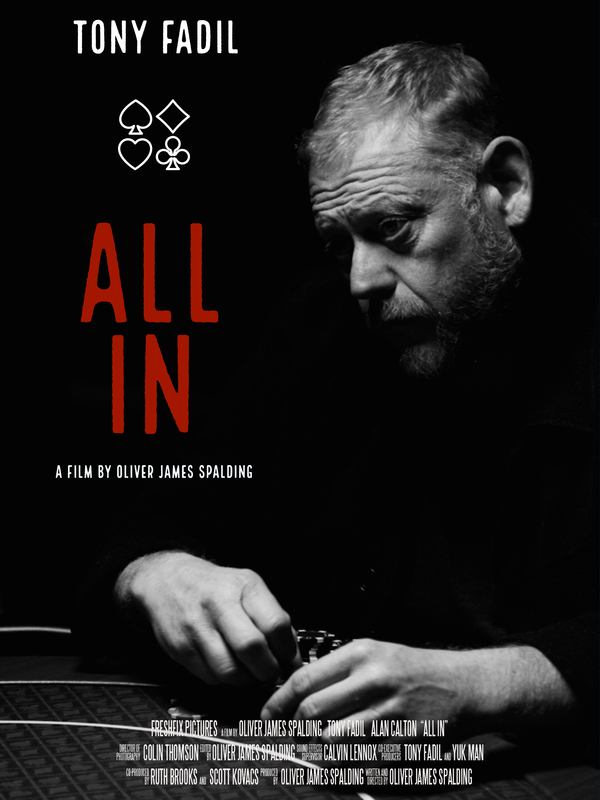 ‘All In’ tells the story of Ash, a middle-aged gambling addict who spends the night at a late-night poker game. The aim of the film is to raise awareness for gambling addiction, an issue I feel is sorely underrepresented in the media landscape. With your help, we can get the film seen by as many people as possible at film festivals around the world. We want to submit to as many film festivals as possible, including Cannes, Sundance, Raindance and London. The film explores themes that have been sorely under-explored in filmmaking and, for this reason, we believe there will be a lot of interest in screening this film at numerous festivals. All of the funds raised will go solely towards entering the film into festivals. With the average price of a submission being approximately £25.00, we’re aiming to raise up to £2,500 to submit the film to 100 festivals around the world. Any pledge of £5 or more will be rewarded with a direct link and password to watch the full film. Oliver is a writer-director from the UK who specialises in narrative films about modern human relationships. As a student at the University of York, studying MA Digital Film and Television Production, Oliver has developed his filmmaking skills, culminating in the production of this short film. Scott is a writer/director/producer creating cutting-edge content for multiple platforms. He specialises in developing original stories, script advising, film production, strategy, and entertainment product placement and brand integration. He is currently studying an MA by Research in Filmmaking at the University of York and is working on a short film about a young man living with schizophrenia. As a co-producer, alongside independent filmmaker Zeke Zelker, Scott has helped develop the groundbreaking transmedia project: Billboard. Colin has a dedicated passion for cinematography, starting at a young age, shooting 35mm stills, picking up his parent’s small handy-cam and creating the simplest of stop motion animation videos with his Lego characters. He completed a degree in film production and continued his heartfelt passion for visual storytelling. Whether working on fiction, documentary, music promos or commercials, Colin loves engaging in film projects in a methodological and original visual style. With experience across all digital formats and training at the National Film and Television School in Super 16 and 35mm, Colin can shoot with any medium. Stuart is a very capable filmmaker and has a broad & intermediate knowledge of the technical side of the industry. He is a creative and artistic visionary and enjoys seeing the beauty in different things and capturing them to convey emotion and meaning. We need as many people as possible to be talking about the film and our aim to submit it in to festivals so please share this crowdfunding campaign on Twitter, Facebook, LinkedIn etc. The more exposure the project gets, the better chance we have of succeeding. All donations are very much appreciated and don’t forget that all donations over £5 will receive a direct link and password to watch the full film. Thanks for checking out our campaign! Watch the full film at Vimeo.com! Help us submit the film to two festivals! Help us submit the film to three festivals! For donating £100 and allowing us to submit to four festivals, we'll invite you to a screening of the film in London.